Are you struggling with getting your dog to follow your command? Do you hate how your dog ignores you? We know how you feel. Let us help you. The number one ingredient to your success is commitment toward your dog training. Salt Lake City owners can know all of the training tools in the world and if commitment is not present then their dog will never listen to them. How do you formulate commitment? Many of us know that commitment is important. Knowing this is different from actually doing it. For example, I am suffering from back, neck and shoulder pain. I am going to a chiropractor. He told me that I have to do my exercises daily on my own or results will not be seen. That is common sense. The question is did I follow through with it? The answer is yes. How did I get committed? Here are some tools to make commitment strong for you. 1.) Have someone help you be accountable. If you have to follow through with daily exercise or dieting alone, you will be less likely to follow through. A friend can help you be accountable because you dog train together daily or they text you daily. Hiring a professional is an option too. They will help you follow through with your dog training. Salt Lake City has Four Legged Scholars LLC that is awesome at creating accountability. 2.) Be motivated. If you are not motivated your commitment will be lower. For example, I am motivated to do my exercises that my chiropractor recommends daily because if I don’t want to be in pain. The motivation to be pain-free is strong for me. Establish a strong motivator to train your dog. Examples: I want to feel comfortable that my dog will come reliably when hiking. I want to feel safe that my dog isn’t going to bite someone. I want to enjoy my leash walks. Etc. 3.) Remind yourself of your motivator daily. Pairing the dog training with a consistent activity will help remind you to do it. I do my exercises at night before bed or in the AM. I never forget then. 4.) Continual follow through is important. An accountability partner can help you with that. 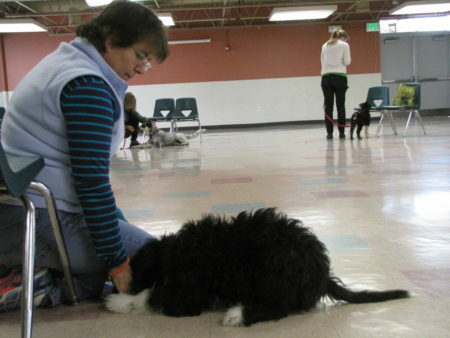 When we sell programs for dog training, Salt Lake City owners pay for the program up front. We don’t allow payment plans. This ensures that the owner is going to complete. If the owner has to constantly re-enroll into the program by paying money they have to move their money fears multiple times. Paying up front allows the owners to move through their money fears one time and then take the plunge to move through any and all obstacles to ensure completion. If step 4 is hard for you then it is time to invest money up front with a dog trainer. Salt Lake City has many positive reinforcement options. 5.) Track your training. Writing things down helps you see progress. It is scientifically proven to help create faster results. Write down what you do everyday or create a training chart. This will help you reach your goal. We want you to be success with your dog training. Salt Lake City clients of ours have journals to track training progress.